After the brooding gloominess of yesterday, today was mostly sunny and warm – so back to the garden I went! As I’ve complained in lots of posts, all the rain has meant a bumper crop of weeds this spring and it was getting a bit out of hand. So I dragged out the brushcutter a few days ago and got it running today (with a little coaxing). In my experience, small engines don’t fare so well if they’re locked up in a shed too long and I generally only use this once or twice a year, so it’s no wonder I need to take it in for servicing now! Bernard Black Bunny was not impressed at all! And even after I’d finished an hour he still wouldn’t come near me for a pat, let along a cuddle! On the other hand, my doe rabbits, Bella and Boudica, stretched out and snoozed like it was all perfectly normal. The chickens kept their distance but were watching me from the safety of their coup, waiting for food as always. Along the back of the chicken coup and the south facing fence, it’s mostly too shady for vegetables, so I’ve planted some aromatic plants that like the conditions and attract bees and native birds. 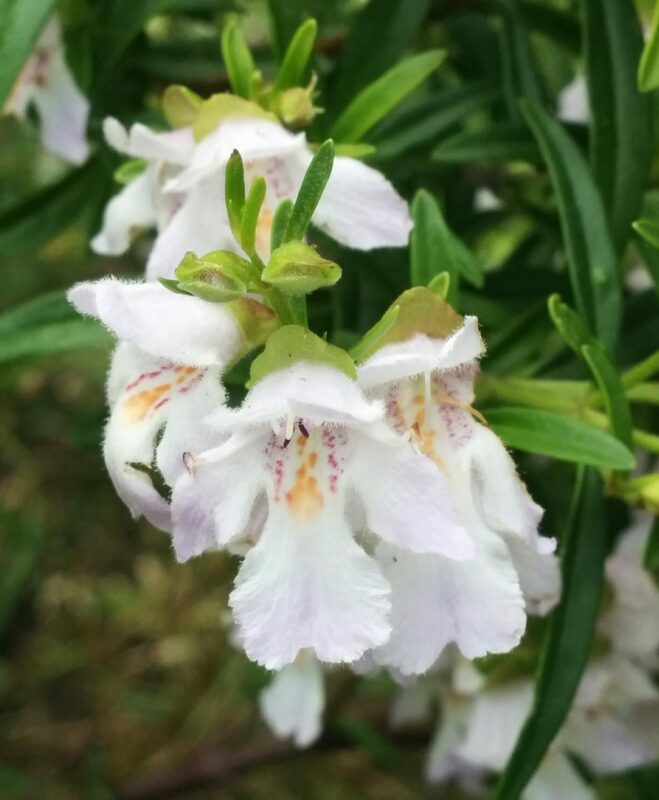 In particular, I’ve got quite a few Australian native mint bushes (Prostanthera sp) which are long time favourites of mine. Behind the chicken hutch I planted a couple of quite low-growing Australina native tea trees last autumn, a Grampians Tea Tree (Leptospermum turbinatum) and a cultivar Leptospermum “Riot”. 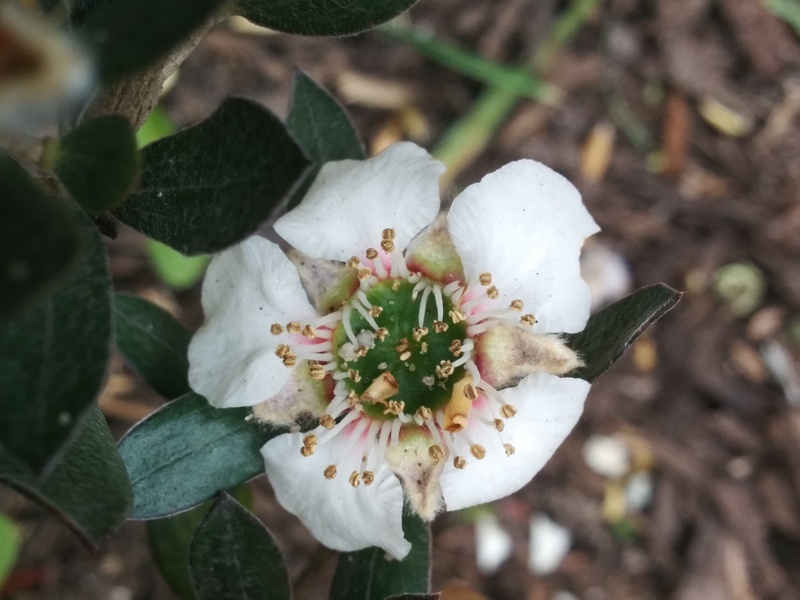 I first saw L. turbinatum many years ago when bushwalking in the Grampians in Victoria and it’s a delightful spreading shrub, with shiny, deep green leaves and classic tea tree flowers. 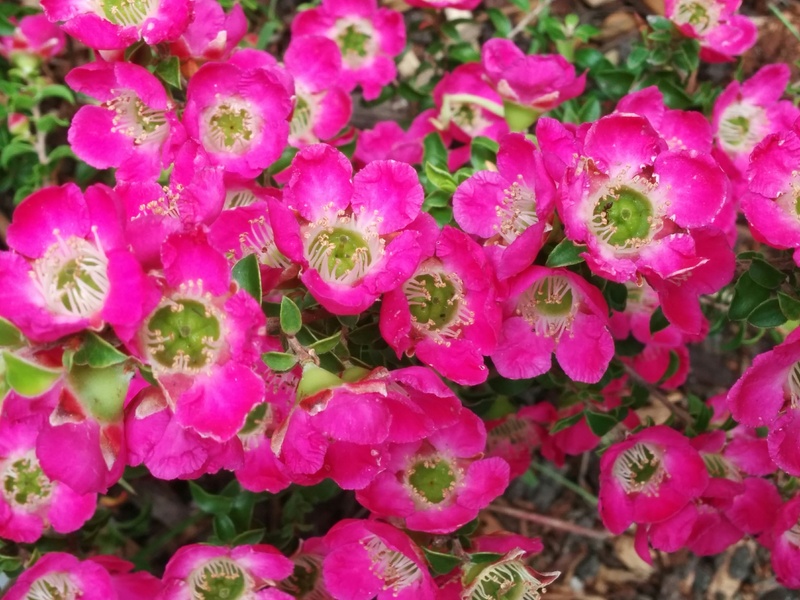 On the other hand, L. “Riot” is a mass of vibrant, cerise pink flowers that cover the plant and are incredibly attractive for me as well as bees, other desirable insects and native birds! Take care and I’ll see you tomorrow!